Welcome to my Red Couch. Bright, festive, and tasty would describe these Jell-O Cookies. 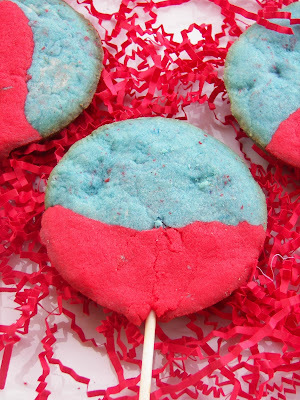 They are flavored with blueberry and cherry Jell-O and I love the turquoise and red colors together. They just remind me of the bright days of summer that will surely come; even though Spring has been a bit cold in my neck of the woods. One of my favorite things to do in the kitchen is to craft with cookies. 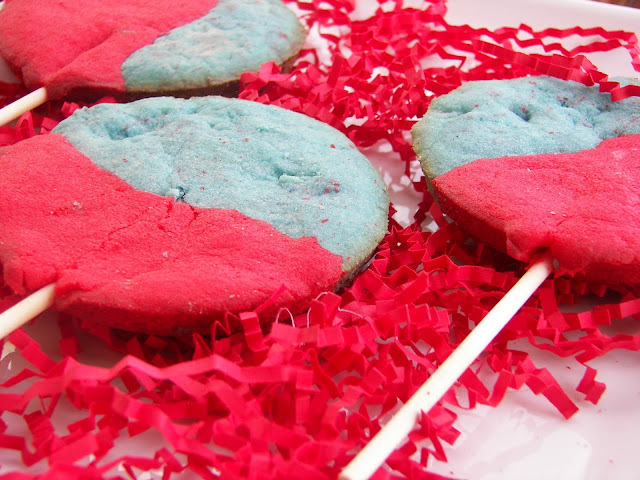 These were made with a Wilton Cookie Pop mold; if you don't have a mold, you could easily make them without a mold.. Check out my sidebar listing to see other Jell-O kitchen crafts. 1 (3 ounce) package of Jell-O -- I used cherry and blueberry and split the packages in half. Mix all ingredients, except Jell-O. If using two flavors of Jell-O, as I did, halve each Jell-O package and the dough and incorporate the different Jell-O flavors in each half of dough. If using Wilton Cookie Pop molds, just press dough into molds -- one half of each flavor. You may need to add a tad bit of flour to make the dough a bit more usable. If not using Cookie Pop Molds, roll dough into balls (at least 2 tablespoons) and flatten, and then insert sucker stick. For the sucker stick to hold, make sure your cookie is somewhat thick. Bake in 350 degree oven for about 10 minutes. Add about 2 more minutes if using the Wilton Cookie Pop Molds. To help insure the sucker stick will stay in place, don't short the baking time. I tried these after you posted about them. They are so good! One bad thing about them is they don't last that long! my kids just gobbled these up. Love what you did with them here! What a great cookie idea! 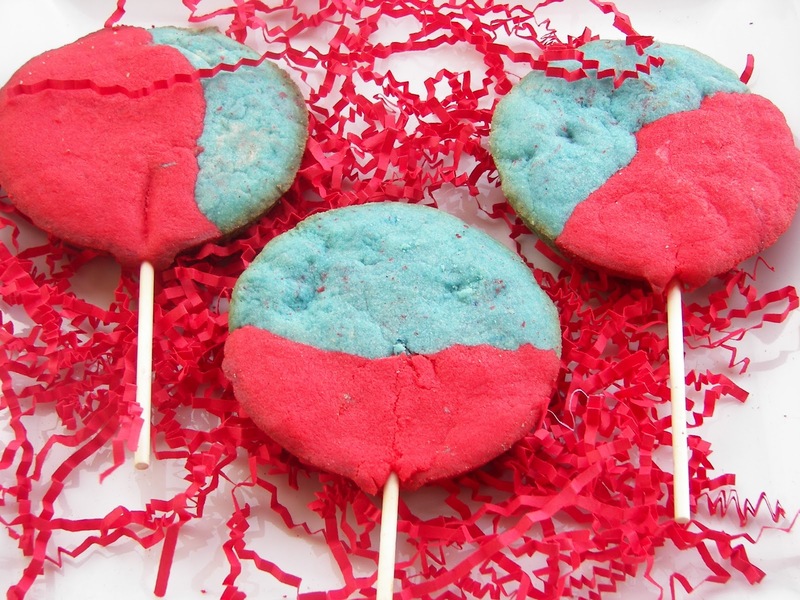 They look so festive and who wouldn't love a cookie on a stick. Joni, you always come up with such original, fun recipes. Yum! what a pretty color combination. Tis is a fun idea. I haunt seen that mold. There are too many fun cookie pops you could make! These are so fun! I love the colors and that the cookies are flavored from the jello:) Great idea! I need to head to the pantry to see what flavors of jello I have. I know there are some in there. These look like something that would be fun to give as a treat because they're festive. I really never knew all the things you can do with Jello! These are fun. Those cookies are so cute. I have been looking for something to make for our memorial day get together. They are so adorable. Thanks for posting! These are bright and colorful! Sound yummy too. What fun! The kids would love them! These are so cute! Very creative.